After an awesome night camping under the stars in perfect weather near Little Black Mountain, we were up early, had a little breakfast and were soon on our way back into Utah. 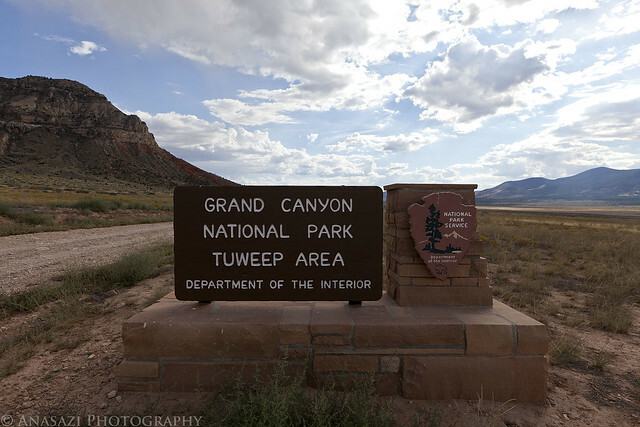 Our ultimate destination for the day would be Toroweap on the North Rim of the Grand Canyon, but we would have a lot of exploring to do on our way there. After entering Utah again, we quickly found ourselves in Warner Valley. As we headed east, we took the short detour to Fort Pearce which is located along the old Honeymoon Trail. 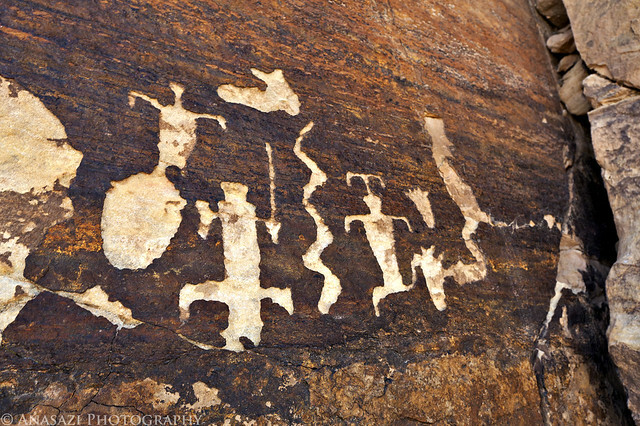 Of course, our first objective at the site was to find the petroglyphs located near the fort. They were easy to find and the area offered a nice view. 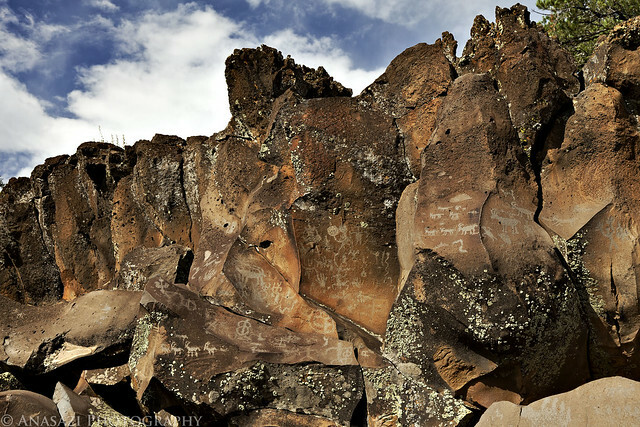 A closer look at the petroglyphs on the slanted boulder. After hiking down into the wash and finding some more petroglyphs and historic signatures, we went back up and visited Fort Pearce. This small structure is one of only three remaining stone guard posts built during Utah’s Black Hawk War. The “war” was actually period of intermittent raiding between 1865 and 1870. During this time period the Ute Tribe, led by Chief Black Hawk (Antonga), and other Native Americans allies attempted to drive the Mormons from the Ute traditional homelands. 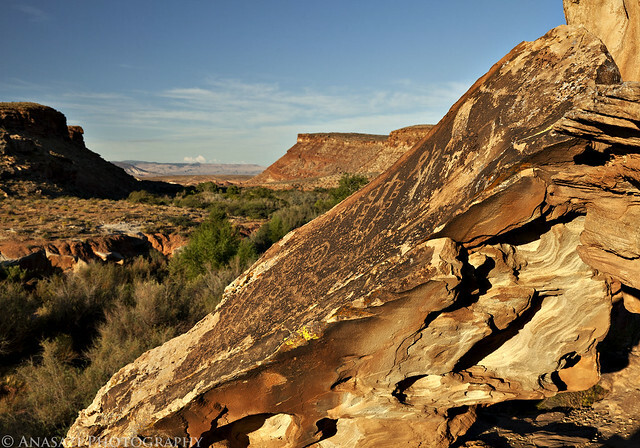 To protect their herds and homes, local Mormon militia constructed a series of protected guard or sentry posts, called ‘forts’, along major trails and travel corridors in central and southern Utah. 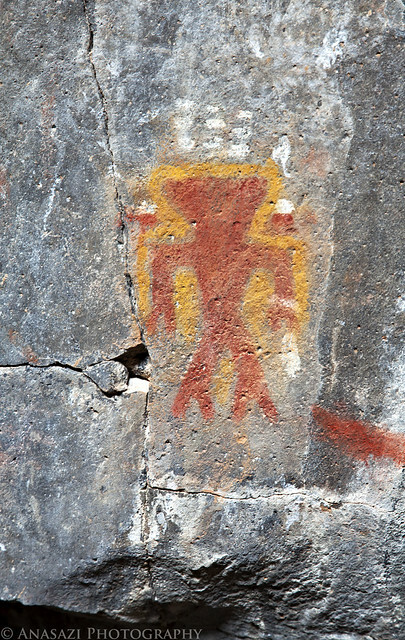 Four to six armed men with horses were stationed at each post, to attack and delay the Indian raiding parties, while a rider raced to the nearest settlements with a warning. 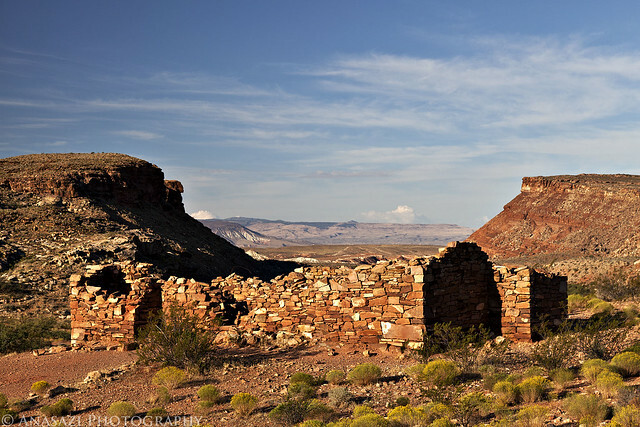 Fort Pearce Wash was one of the primary routes along which Ute-Navajo horsemen traveled to raid the livestock herds and settlements of the St. George Basin. No armed conflicts are known to have taken place at Fort Pearce, but the guard post was manned, at least intermittently, from 1866 until 1873, when peace negotiations and U.S. Army actions ended the raiding that was known in Utah as the Black Hawk War. 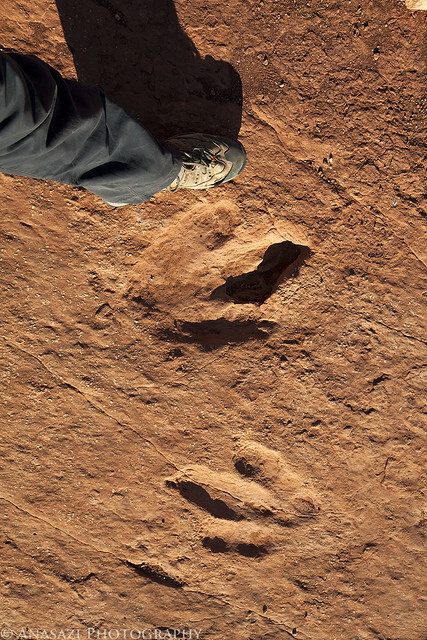 Next up was a stop at the Warner Valley Dinosaur Trackway. There were a lot of tracks here….both large and small. Apparently, there are estimated to be about 400 tracks in the area, though many are covered with sand. 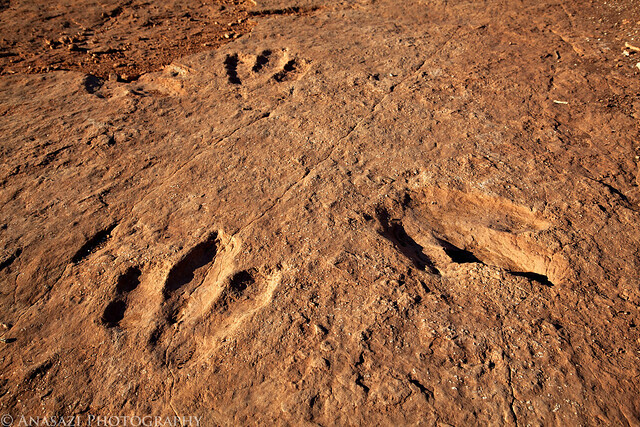 Here are some of the better and larger tracks found at the site. 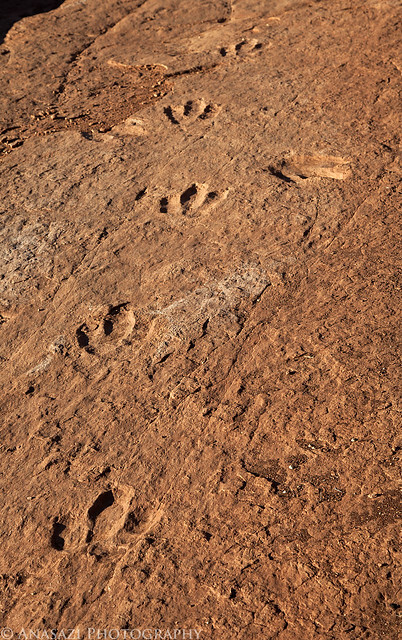 Paleontologists cannot tell what specific dinosaur left a track, but they can be tied to a general group of them. Two types of tracks have been identified here belonging to the Grallator and Eubrontes groups, tracks ranging from 10-16 inches and about 7 inches respectively. Here’s a closer look at a few larger tracks. Here’s my foot for a little scale. I wear a size 15 shoe. From Warner Valley we headed further north to Hurricane. This photo was taken along the way. 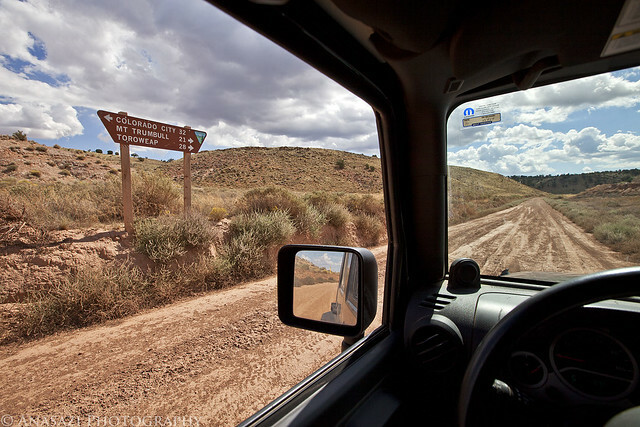 Soon we were heading south towards Colorado City and Arizona again. 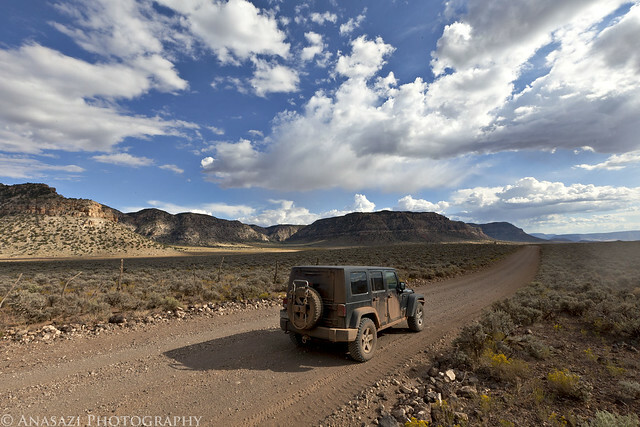 Just before reaching the state line we turned off to visit one more site in Utah….Canaan Gap. 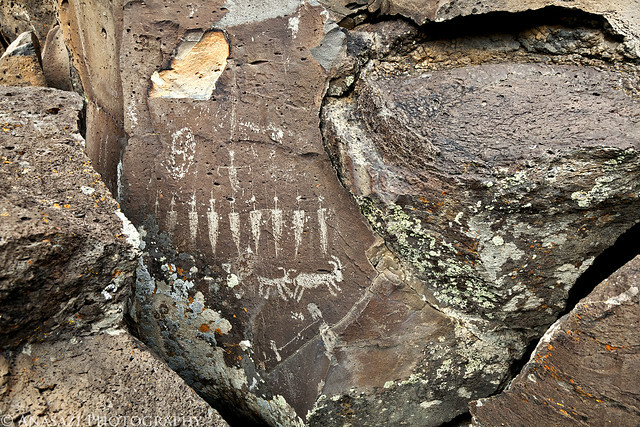 I wasn’t planning on fining too much at this site, but we were pleasantly surprised to find many interesting and unique petroglyphs here. These are some of the most interesting because of how deep they are. I do not believe that they were originally carved this deep and that they have eroded out over the years to become deeper…..but I might be wrong about that? However it happened, it’s a pretty cool site! Here’s a closer look at the right side of the panel I posted above. A closer look to see just how deep they are. 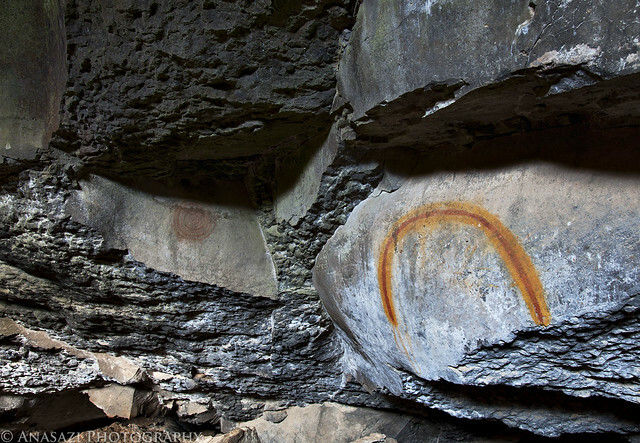 Here’s another very cool panel located at Canaan Gap. There is a lot going on in this one. 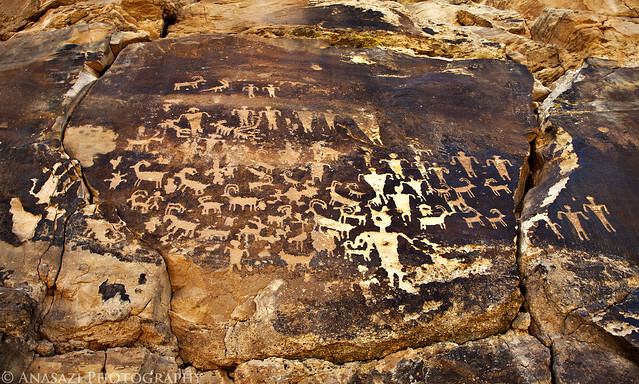 It kind of reminds me of the Great Hunt Panel in Nine Mile Canyon because of the way all of the figures are grouped together. If you look at the very left side of the panel, there is even an upside-down anthropomorpic figure. 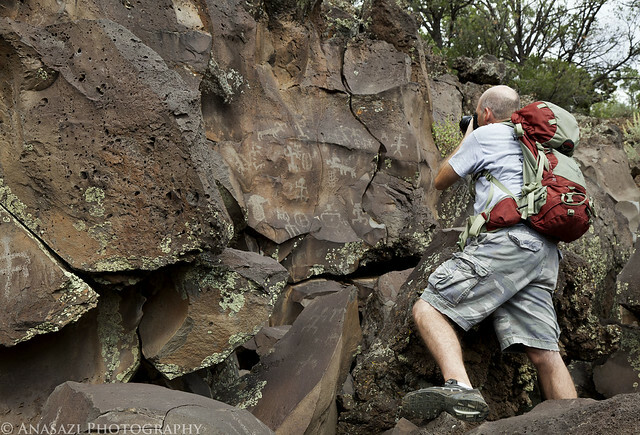 Before hiking back to the Jeep, Jared spotted a boulder that he thought we should check for more petroglyphs. 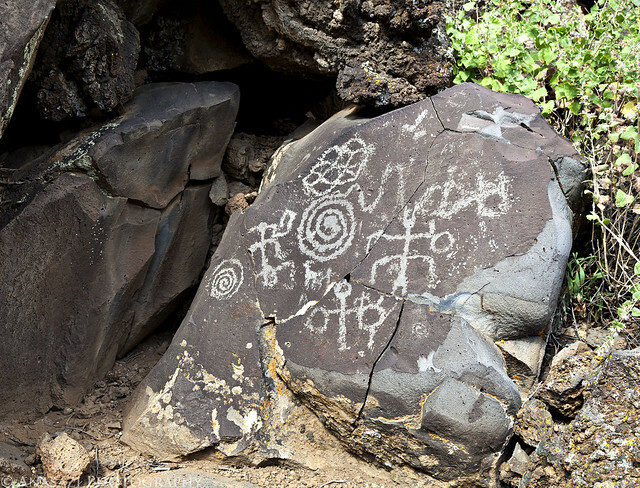 It turns out his instinct was right, since we did find a few more deep petroglyphs located there. 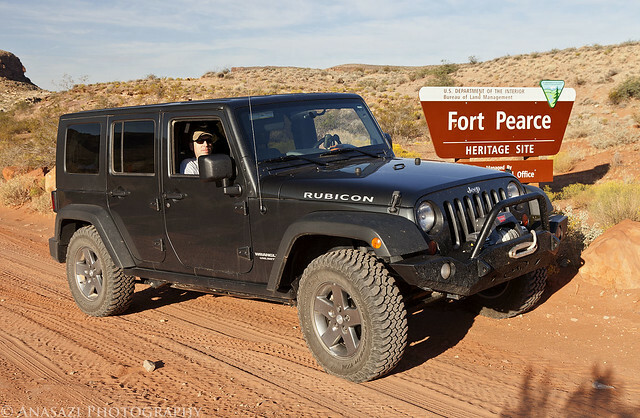 We fueled up the Jeep on the border and then were headed south into the Arizona Strip and towards the Grand Canyon and Toroweap. More than half-way to Toroweap. 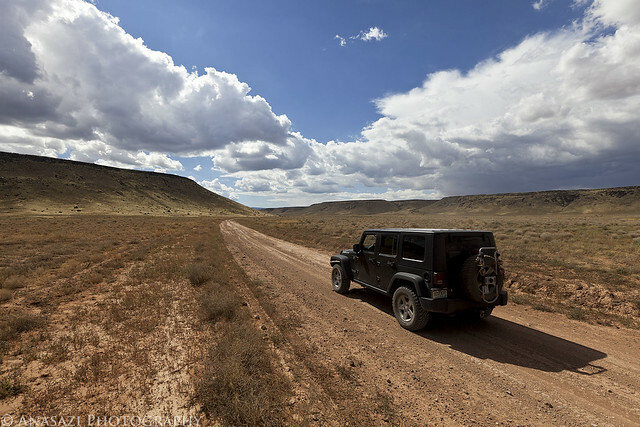 I have always heard horror stories about how bad the roads are to Toroweap and that many people get two flat tires on their journey…..however, I was actually surprised at how well maintained the main roads were. Lots of high speed gravel road driving and kicking up dust. 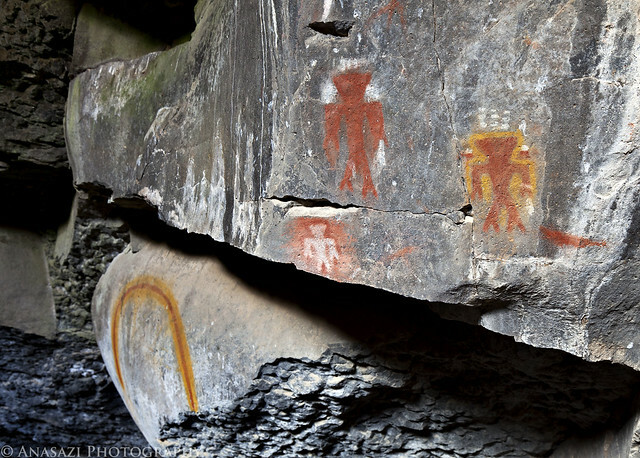 We turned off the main road onto a little-used two-track so that we could visit another pictograph site. A storm is approaching in the distance. 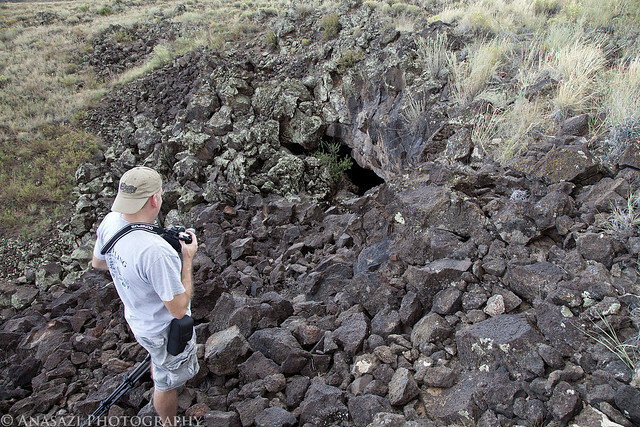 Pretty soon we had reached Paiute Cave…a collapsed lava tube. This is the entrance. The trail down into it was over some rather large boulders and once inside the cave, there were plenty more loose boulders to scramble over as we explored the cave. It was pretty dark inside so a tripod was necessary for these photos. Unfortunately, getting the tripod setup in the jungle of boulders was challenging and frustrating at times……but worth it. 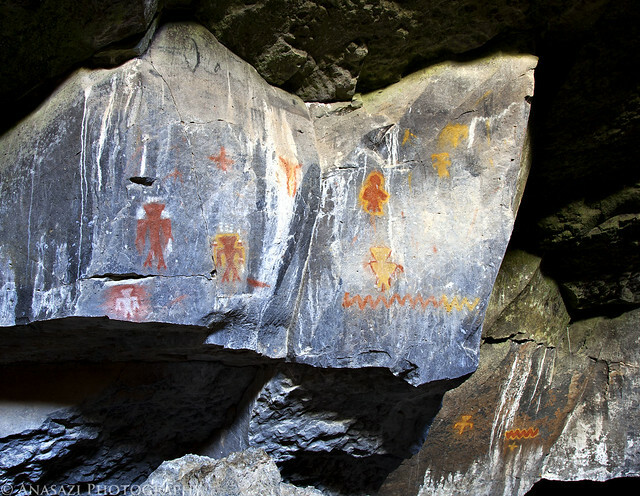 Inside Paiute Cave are some of the most vibrant pictographs I have ever encountered…so far. 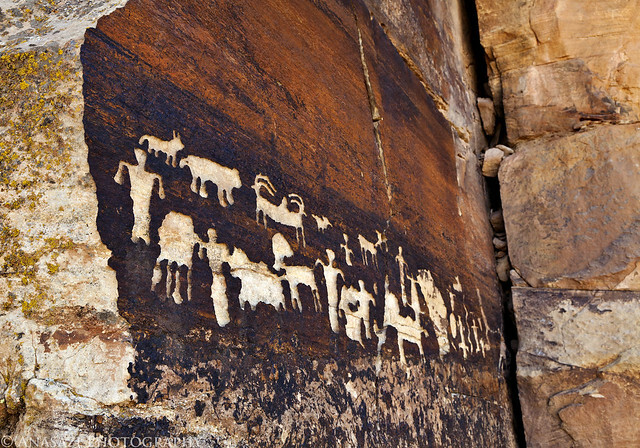 While the cave is named after the Paiute, the amazing pictographs found hidden inside were actually created by the Virgin Kayenta Anazasi at least 600 years ago. I’ve posted a few photos below from this site. 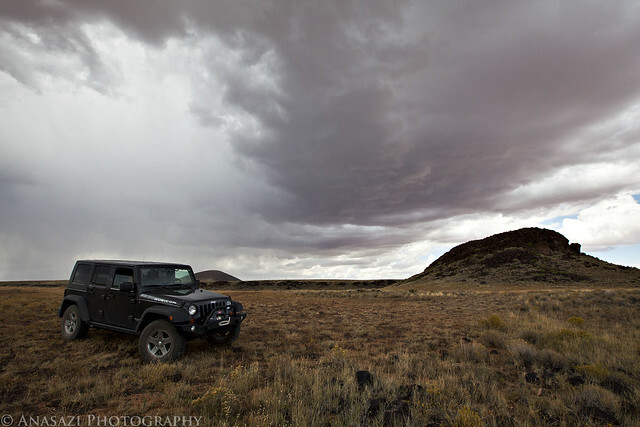 When we finished up exploring Paiute Cave, we climbed back above ground to find that the storm that had been off in the distance was now overhead. The temperature outside had dropped at least ten degrees and the wind started to pick up. Luckily there were only a few sprinkles of rain. 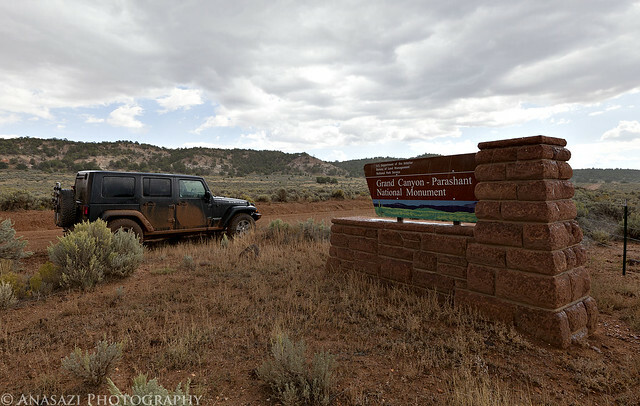 Entering the Grand Canyon – Parashant National Monument. 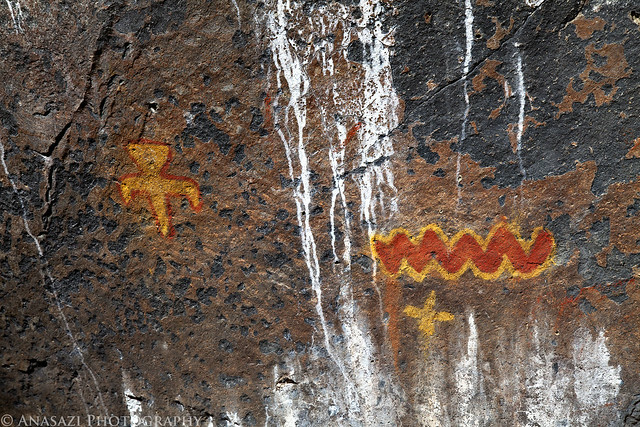 Pretty soon we were at our next destination, and last rock art site of the day….Nampaweap. 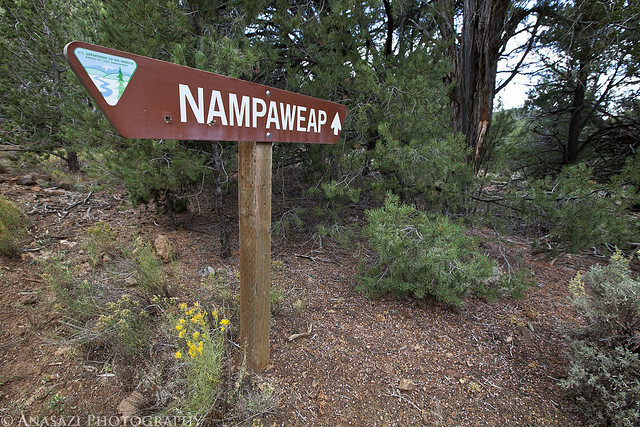 Nampaweap means “foot canyon” in the Paiute language and is one of the largest known rock art sites on the Arizona Strip. 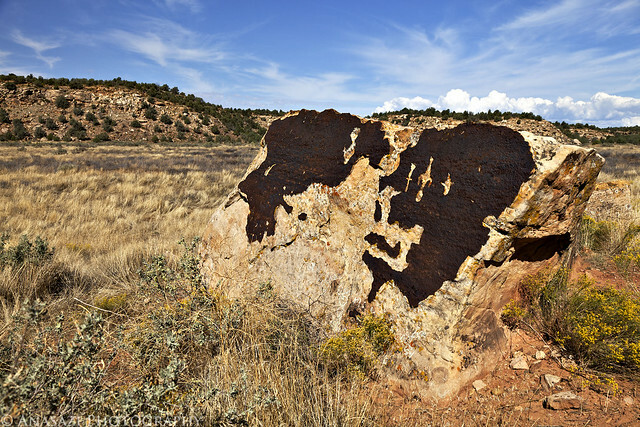 This canyon could have been an important prehistoric travel corridor from the Grand Canyon to the resources of the ponderosa pine country near Mt. Trumbull. 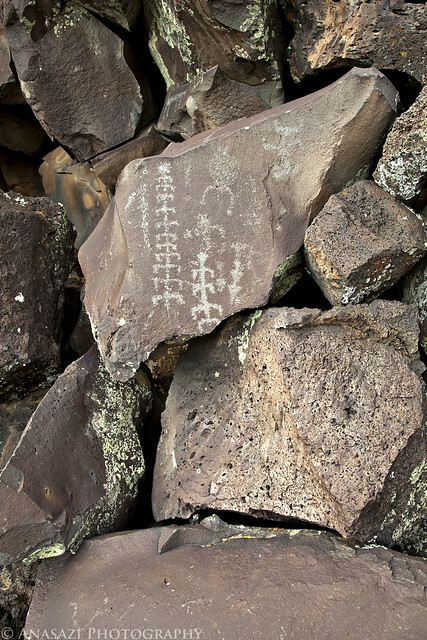 After following the short trail to the petroglyph site, this is one of the first boulders we found that had some petroglyphs on it. 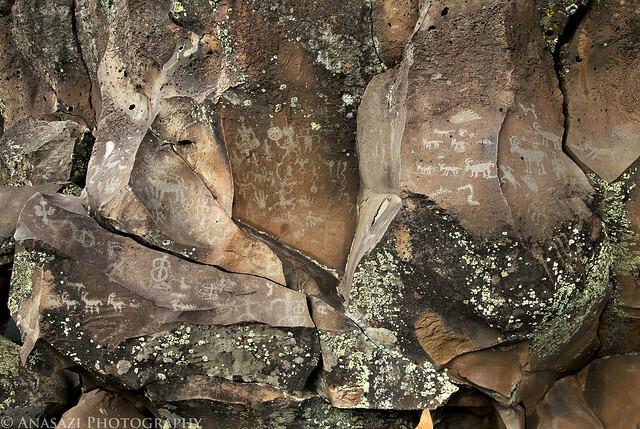 Then we started to realize just how many of the boulders and cliff faces in the area had petroglyphs carved into them. In places it seemed like almost every boulder had some kind of carving on it. 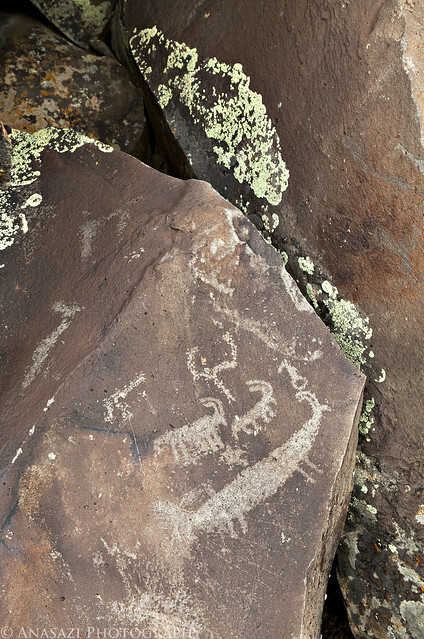 It was hard to explore and watch our step so that we didn’t step on or touch any of the petroglyphs. Jared taking a photo of one of the many panels in the area. 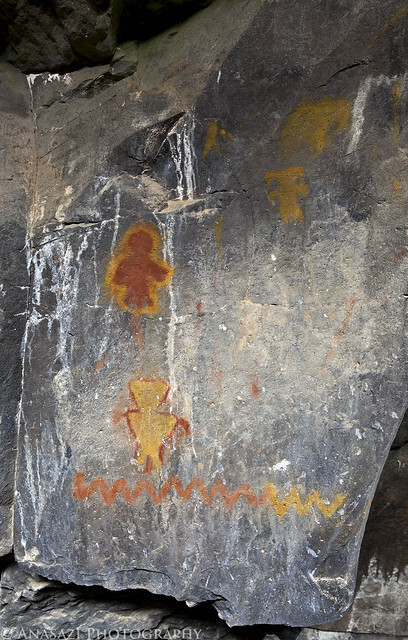 A line of small anthropomorphs hidden behind some boulders. 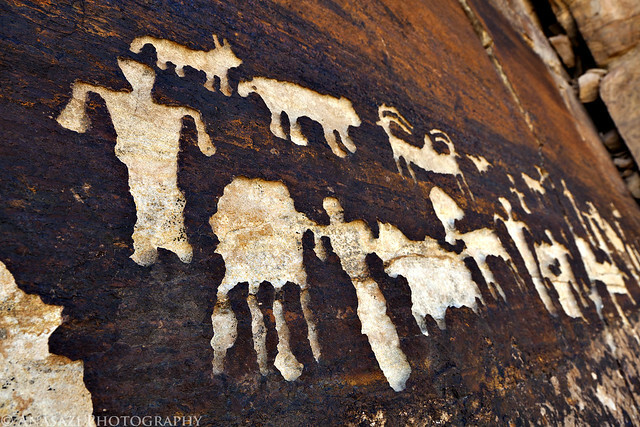 This boulder has a few sheep and one really elongated sheep carved on it. 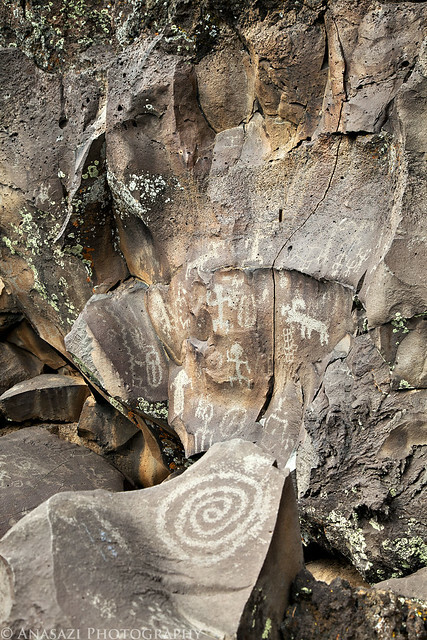 A typical scene found at Nampaweap…..boulders, petroglyphs and lichen. I found plenty of interesting compositions to photograph. Most of the time we spent exploring the site was spent with a cloudy overcast sky which helped keep the shadows away. 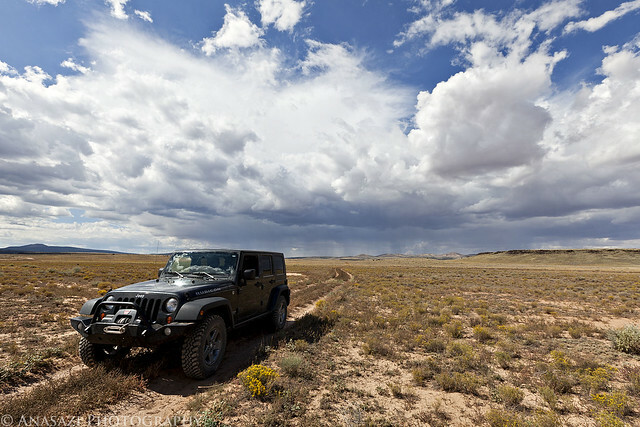 However, shortly before we hiked back to the Jeep the clouds started to scatter and I was able to take a few photos with some blue sky. This was an interesting spire-like boulder that protruded from a pile of other boulders. 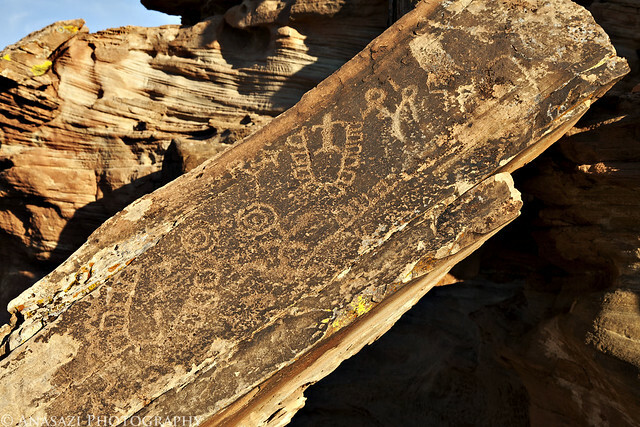 There also happened to be petroglyphs carved at it’s base. 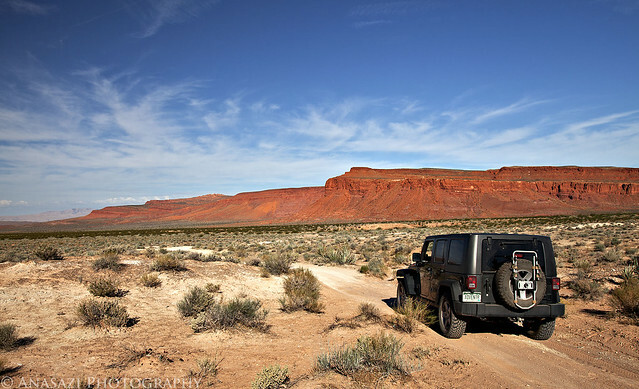 After we finished checking out Nampaweap it was back to the gravel roads on our way to Toroweap again. 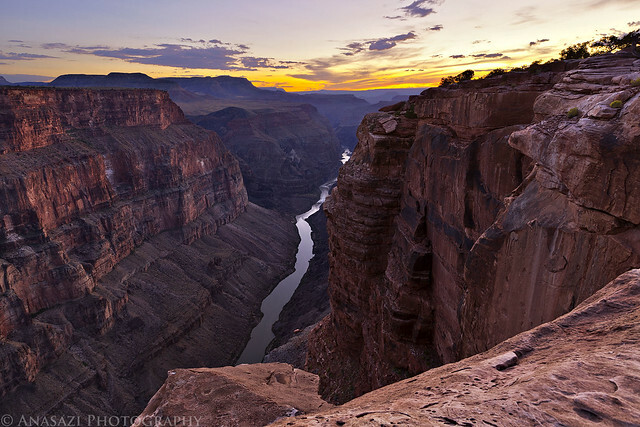 Finally, Grand Canyon National Park. This was actually my first visit there……never even been to the South Rim yet. I’m guessing the North Rim is more suited to me, though. After driving a few more miles into the park we went to check out the campground. I wasn’t planning on camping within the park because I thought that they would charge you, but was pleasantly surprised to find out that camping is free. There are 10 sites and they are first come first served. We drove down the rough campground loop and found there were still two sites left, so we setup camp in site #4. 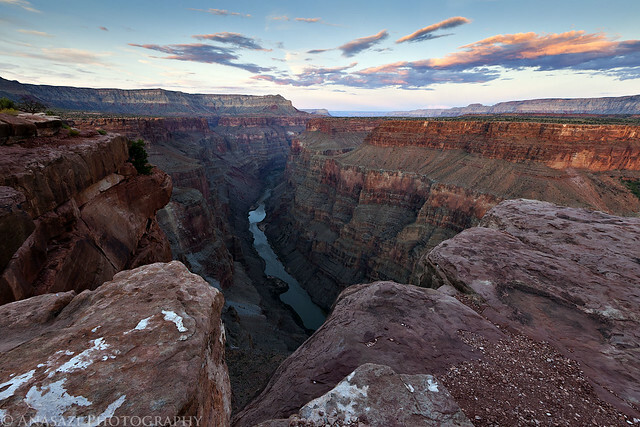 When we had finished setting up camp it was dinner time, so we both had some dinner and then made our way over to the Toroweap Overlook for sunset. After exploring the different viewpoints from the overlook, I settled on a view looking East. I composed the shot and waited for the sun to do the rest. The view from up there is amazing! After photographing to the East for the sunset, Jared and I grabbed our cameras and tripods and started heading back to the Jeep. As we walked that way I noticed that the sky to the West was getting some nice color, so we quickly got back to the rim of the canyon, found a nice viewpoint and setup our cameras again before it was too late. This is my shot looking towards the west after the sun had dipped below the horizon. Have you been to the Shaman Gallery/Gordan Panel? I live in Louisville and was coming out in April and wanted to know if getting to the site caused any problems. I like your blog. Yes, I visited the Shamans Gallery last October. No problem getting there….the road is easy and the hike wasn’t too difficult. I’m an admirer of your exploits. 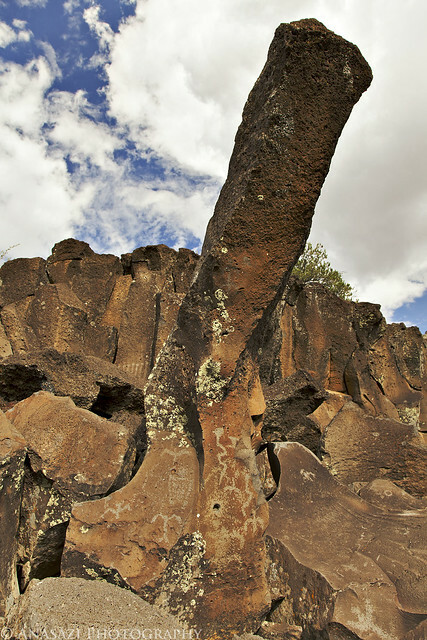 I’ve been researching “Paiute Cave” (lava tube) near Tuweep. I haven’t found any good GPS Coordinates of directions. Any chance you can assist? BTW: I’m leading amber group of folks to Shaman Panel in March. Still one of my favorite destinations.